Time travel is a popular topic in science fiction. Just the thought of travelling into the future or the past and experiencing this other time yourself is both fascinating and inspiring. And since Albert Einstein has taught us with his theory of relativity that time does not pass in the same way everywhere, the subject of time travel has also been controversially discussed in real science. Could time travel really be possible? In the lecture Time travel and temporal logic by Dr. Hubert Zitt, the theory for time travel is explained from a scientific point of view, but nevertheless understandable for everyone. Using concrete examples from the science fiction classics Star Trek and Back to the Future, the phenomena and paradoxes that can occur during time travel are discussed in a very entertaining way. Dr. Hubert Zitt studied electrical engineering and works as a lecturer in computer science at the University of Applied Sciences Kaiserslautern on campus Zweibrücken. In addition to his "normal" teaching activities, Hubert Zitt has become known throughout Germany (and beyond) for his Star Trek lectures. Together with Gene Roddenberry jr., the son of Star Trek-inventor, wrote Zitt 2008 the preface to the book "Star Trek in Deutschland". In autumn 2008 he taught "Physics of Star Trek" as a regular course for a whole semester at a university in San Antonio, Texas. Meanwhile Hubert Zitt has already given over 350 Star Trek lectures and participated in several television programs about Star Trek. 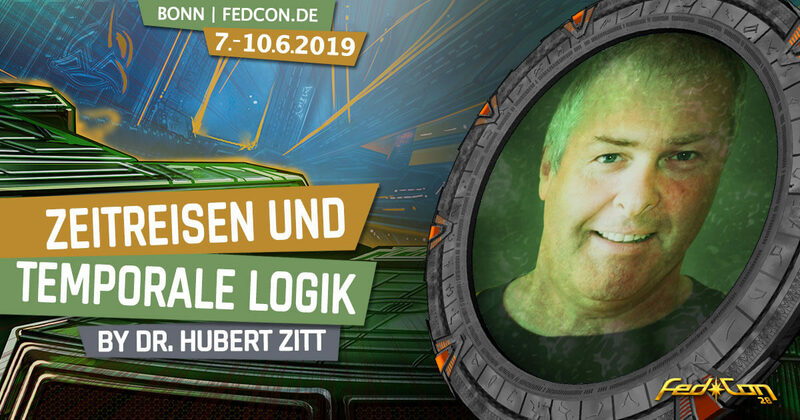 He has been a regular guest at FedCon since 2005 and was awarded the "Most Extraordinary Speaker of the Year" prize for 2012 by his agency "5-Sterne-Redner".